First, I would like to make the difference between Street Art and Graffiti clear. Graffiti writing and street art are often confused with one another. Both are subversive art movements where work is mostly displayed on streets or placed in nature. However, it is not easy to explain the difference between them as an absolutely correct definition does not exist. 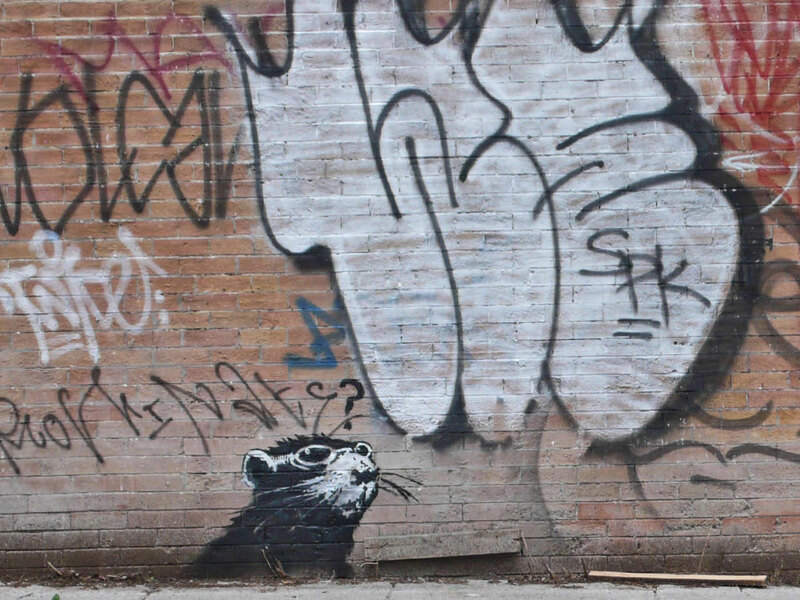 Let us take a closer look at graffiti and its meaning first. In the Oxford Dictionary graffiti is defined as: “Writing or drawings scribbled, scratched, or sprayed illicitly on a wall or other surface in a public place”. Graffiti ranges from simple written words to elaborate wall paintings and is mostly scratched or sprayed on a visible surface. We all know the infamous form of graffiti called tagging, which basically means leaving a signature on random places. Street art is defined as visual art that is created in public space as well; however it also includes stencil graffiti, posters, stickers, street installations or sculptures. Street art hides a deeper meaning most of the time and often tries to raise awareness of social or political issues. Graffiti lacks mostly greater meaning, its value is appreciated by the visual appearance of the piece itself. This brings us to the problem of perception of these two art movements. Street art is generally more easily accepted by the public than graffiti. The main reason for this behavior is that people often look at graffiti as a meaningless desire to make itself visible by damaging the property of others. It is often associated with anti-social behavior and gang culture. While street artists want people to be engaged by their work as it is supposed to carry a deeper meaning, most graffiti writers say that they are not interested in the public understanding of their work. They want to speak to other graffiti writers, who can truly understand and objectively appreciate their work. Nevertheless, it is hard for the majority of people to identify graffiti as art, especially when it comes to tags which are looked at as an absurd urge to vandalize other’s property by writing nicknames all over the city. 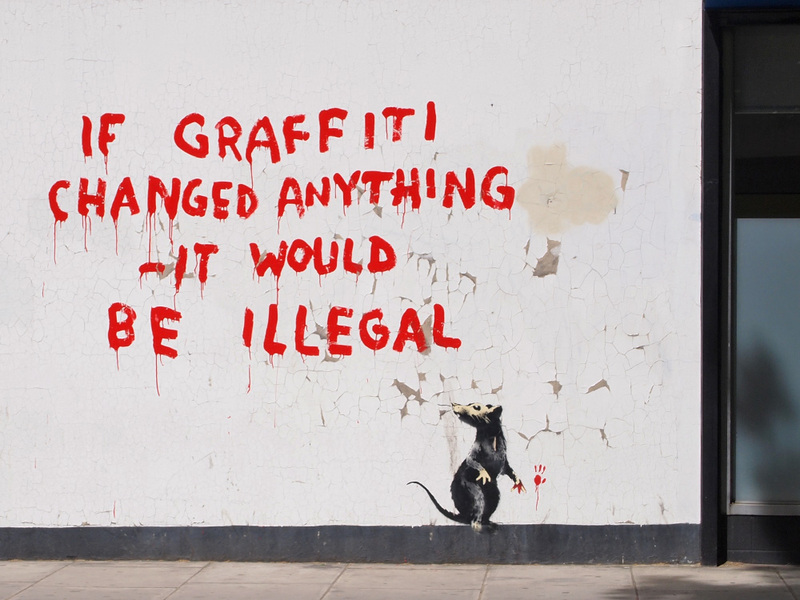 Even though street art got quite popular in today’s society, it is still perceived as a crime. However, in these days even galleries worldwide are starting to appreciate street art and are finding ways to collaborate with the artists. Graffiti writers and street artists are bringing their concepts in in order to create pieces on canvases for galleries and museums. 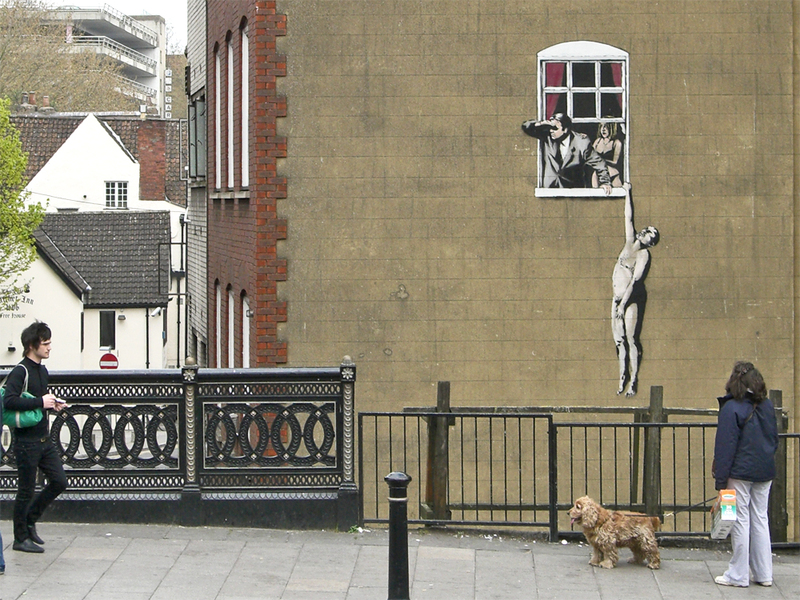 The legendary street artist Banksy is the first man responsible for bringing street art into gallery spaces. A couple of years ago he was sneaking his work into the Louvre and Tate Britain. Ironically, Tate Modern is selling his book “Wall and piece” in its gift shop at the moment. “Tagging” is actually a modern form of scratching one’s name in the wall. It is usually done with markers or spray paint. Nevertheless it is separate from graffiti itself and is the movement most closely associated with hip hop culture. The first ‘tags’ allegedly appeared in New York City in the late 1960s. That brings us to the question when and how Street Art and Graffiti actually developed? People have been painting and writing on walls throughout history. In prehistoric times, people in Africa and Europe used to paint pictures of animals, figures and such in caves. Graffiti has been found on the walls of ancient sepulchers or ruins, as in the Catacombs of Rome or at Pompeii. In the late twentieth century, graffiti and street art became an international phenomenon. As mentioned above, in the late 1960s, young people in New York started to write their nicknames all over the city, later this behavior gained the appellation “tagging”. 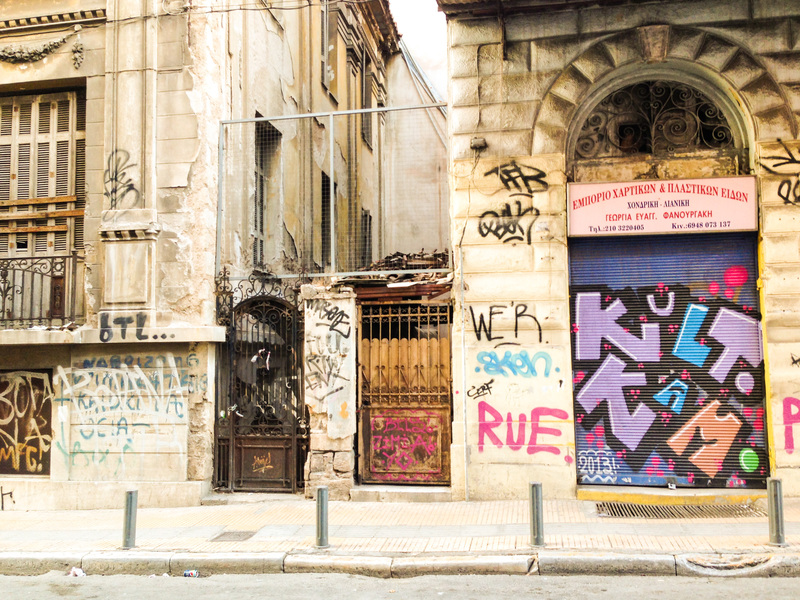 One of the first “taggers” was the Greek-American teenager Demetrius. Demetrius’s tag was TAKI 183. His tag was short for Demetraki, a Greek alternative for his birth-name. The number stood for the 183rd Street in the Washington Heights in northern Manhattan, where he lived. Demetrius started to write his tag on the walls in his neighborhood and later in New York’s subway stations using just simple markers. Naturally people started to notice his tag as it appeared on random places all over the city. Even The New York Times ran an article on the front page about his famous tag. In the 1970s graffiti became a way for many teenagers to try to get attention like the one TAKI 183 received. Later on, people started to use spray paint for their tags and produced more time consuming and elaborate full-wall pieces. It became a common thing to see graffiti on trains, buses, walls and other places in cities around the world. Continue to The Issue of Street Art & Graffiti – Part II ! Lovely post! Such an interesting read! Great post! Don’t forget the Aboriginal rock art in several areas of Australia, which date back 40,000 years (or more). I love the murals artist do, but tagging is so personal, like carving initials into trees. I have more trouble relating to it. I appreciated your history here. Great post! I´ve been photographing street art aroudn the world for two years. And though I appreciate the art I always come across many people that feel like I´m glorifying a crime, well mainly my parents. I think the best way to experience a culture and art is by going to the streets and discovering littler hidden gems. Great post about a important issue. I follow quite a few street art bloggers. Thanks for visiting my site or I would never have known about you. Will follow you from now on. Thank you for your words! I followed you back, I enjoy reading inspirational posts and travel diaries. Have a beautiful day! Thanks for sharing the facts on the topic less pondered!